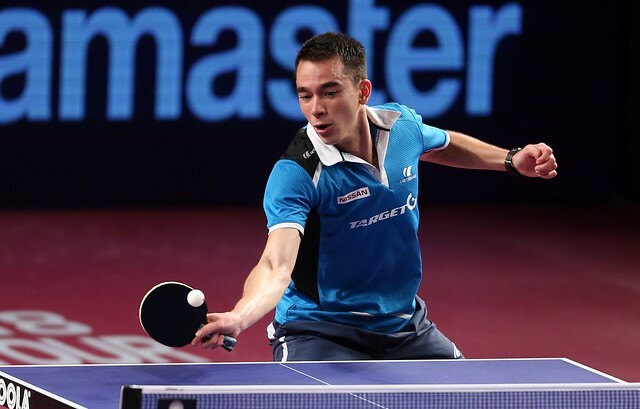 Dynamic incisive performances, China’s Lin Gaoyuan and Brazil’s Hugo Calderano booked their places in the penultimate round of the Men’s Singles event at the Seamaster 2018 ITTF World Tour Platinum Qatar Open, following breathtaking performances on the late afternoon of Saturday 10th March. Different styles in the fact that Lin Gaoyuan is a left handed shake-hands grip player and Wong Chin Ting is a right handed pen-holder but the common factor is speed; in Doha when that item was in question Li Gaoyuan held the upper hand. The pace at which he attacked gave Wong Chun Ting minimal time to recover; Wong Chun Ting was forced time and again into an unfamiliar passive role. Quickly into a rhythm, Lin Gaoyuan was relentless. Simply for Wong Chun Ting nothing went right, for Lin Gaoyuan whatever he touched turned to gold. Meanwhile, for Hugo Calderano there was a debt to settle; he had met Tomokazu Harimoto on two previous occasions in World ranking events, on both occasions he had experienced defeat. Both contests had been in semi-finals on the ITTF World Tour. In 2016 in Tokyo he had experienced defeat in the Under 21 Men’s Singles event, last year in Olomouc he had suffered the same fate in the Men’s Singles competition. In Doha, he extracted revenge in clinical fashion. The only moment of any concern for Hugo Calderano came in the fourth game when having established a 10-3 lead, he lost the next four points. He called “Time Out”, took a deep breath, returned and finished matters.